Instantly add Bootstrap form styling to all your Formidable forms. 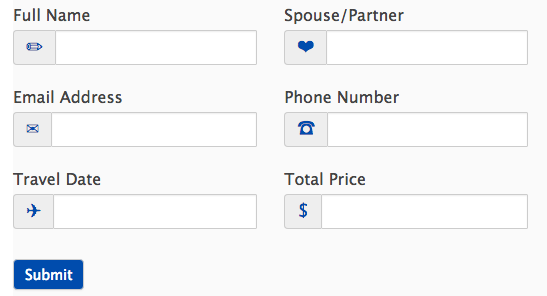 This plugin also adds the option to prepend or append a symbol, such as currency, to your fields. In your WordPress admin, go to 'Formidable' → 'Add-Ons' and click the 'Install' button for the Bootstrap Forms WordPress plugin. After the plugin is activated, the full Bootstrap CSS will be included on your site, which means you will have access to a variety of CSS classes. You may refer to the Bootstrap docs for a complete look at what this add-on offers. Many of the Bootstrap classes can be placed in the 'CSS layout classes' box in your field options. Specifically, the sizing options found here can be used in the "CSS Layout Classes" box. Navigate to the field you would like to modify and open the Field Options. Add any symbol or text that you would like in the Prepend and Append setting. Follow the steps below if you would like to append a unicode character to a field. Wikipedia has plenty of unicode character charts. Just make sure to choose a chart that displays the character in base+VS15 (text) format as shown in the image above. Copy the character you want to prepend to a field. Paste the unicode character you chose in the include before input setting. Preview your form. If the unicode character you chose appears as a box, that character is not compatible with your browser. Best practice would be to select unicode characters that are cross-browser compatible (the simpler the better). If the character you chose appears, but is very small, you may have copied the emoji or base code point version of the character. You will need to go back to step one and make sure you copy the base+VS15 (text) representation of the character. Just change glyphicon-calendar to the correct Glyphicon title. Go to 'Formidable' → 'Styles' → 'Custom CSS'. Change #004cad; to the color you desire. An example is shown below with the icons matching the color of the submit button. Change 'large' to any font-size of your choice.